VATICAN CITY (CNS) — The cross is a sign of God’s love for humankind and not just an emblem of Christianity or a piece of jewelry to display, Pope Francis said. 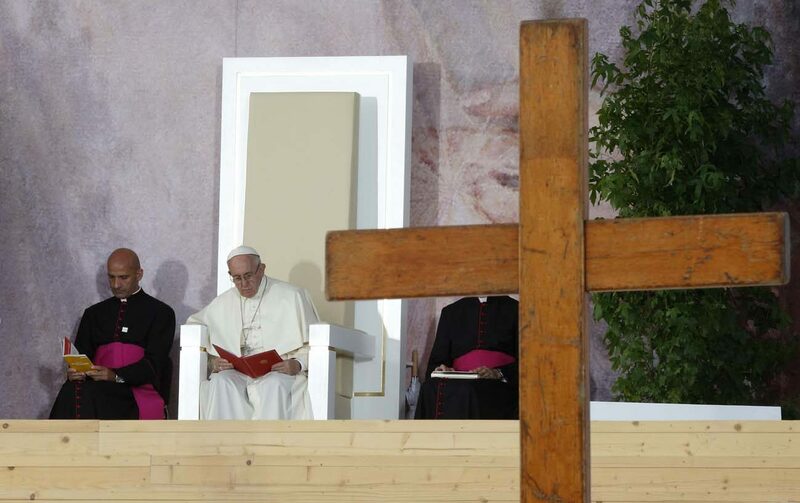 The cross is a symbol of “the power of God who made himself sin to heal us,” and its significance can be lost due to a lack of faith in its saving power or the desire to show off, the pope said April 4 during his morning Mass at the Domus Sanctae Marthae. “For some people it is a membership badge: ‘Yes, I carry the cross to show that I am a Christian.’ That is good, but it isn’t just a badge as if you were part of a team — a team logo — but a reminder of the one who made himself sin,” the pope said. Reflecting on the day’s reading from the Book of Numbers (21: 4-9), which recounted the healing of the people of Israel who were poisoned by serpents, the pope said the bronze serpent was not only a reminder of how sin entered the world but also a “prophecy” of Christ’s death on the cross. “Salvation comes only from the cross, from this cross where God was made flesh. There is no salvation in ideas; there is no salvation in good will, in wanting to be good. No! The only salvation is in Christ crucified because only he — like the bronze serpent — was able to take upon himself the poison of our sin and heal us,” the pope said.